One of the things I like most about making art quilts is their size. 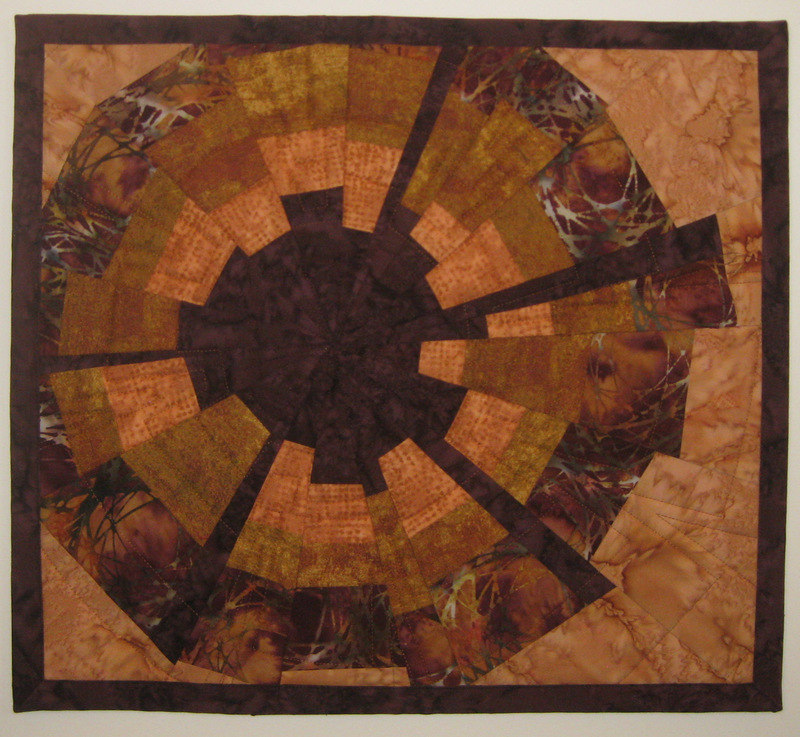 I like being able to create quilted wall hangings that range from about 15″ x 15″ to as large as 40″ x 60″. 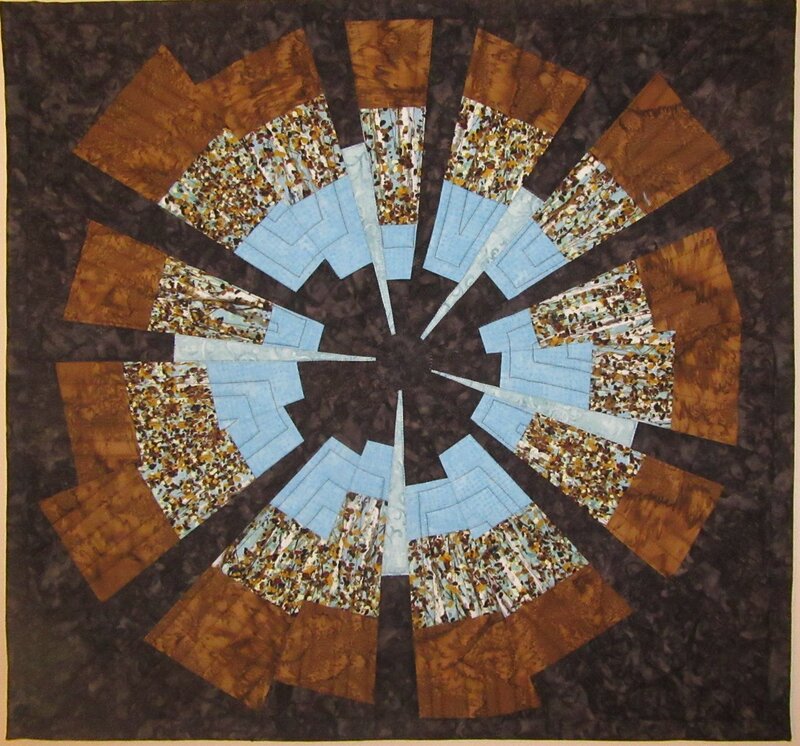 Most of the quilts in my shop are around the 22″ x 32″ size. These sizes mean that new ideas can be translated into new quilts within a few days. 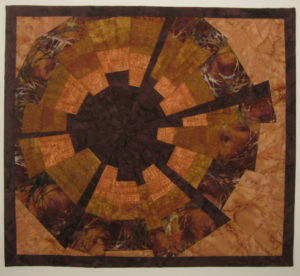 I have several designs of art quilts that I make again after the design in stock is sold. However, being easily bored, I often try a new variation or different colors to keep the creative juices engaged. I wanted to try some new colors and design with my second Brown Rust Star. I take many photographs of each quilt so that I can study the photos if/when I want to make a new version or a custom version for someone. 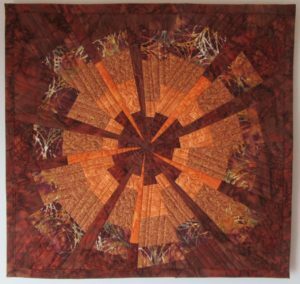 For this quilt I used only 4-5 different fabrics and pieced them in irregular and wonky ways into rays for a star or sun shape. First I decided to keep a dark center but also try a dark fabric for the outside, different from the lighter fabric in the original which is shown in the upper left of this post. I am drawn to darker colors. I still had a few of the fabrics from the original quilt which I really liked so some colors remained the same and some changed. As I was arranging my ray pieces on the design wall which I put together first, I started thinking about putting five extra very narrow rays scattered somewhat regularly throughout the quilt. I wanted a similar orange color for the narrowest part of the new rays and then wanted the same background color for the other half of the ray so it looks like it blends into the background. I made one ray and stuck it on the flannel board and stepped back. It looked good! So I made the other 4 narrow rays and placed them. Keep in mind the only sections of the quilt sewn together at this point are the larger pieced rays. It is so easy to play around with fabrics on a design wall. And it affords you the opportunity to try new designs and color combinations without much (or any in this case) ripping out. I liked this new addition to the previous design! A new quilt was ready to be pieced. 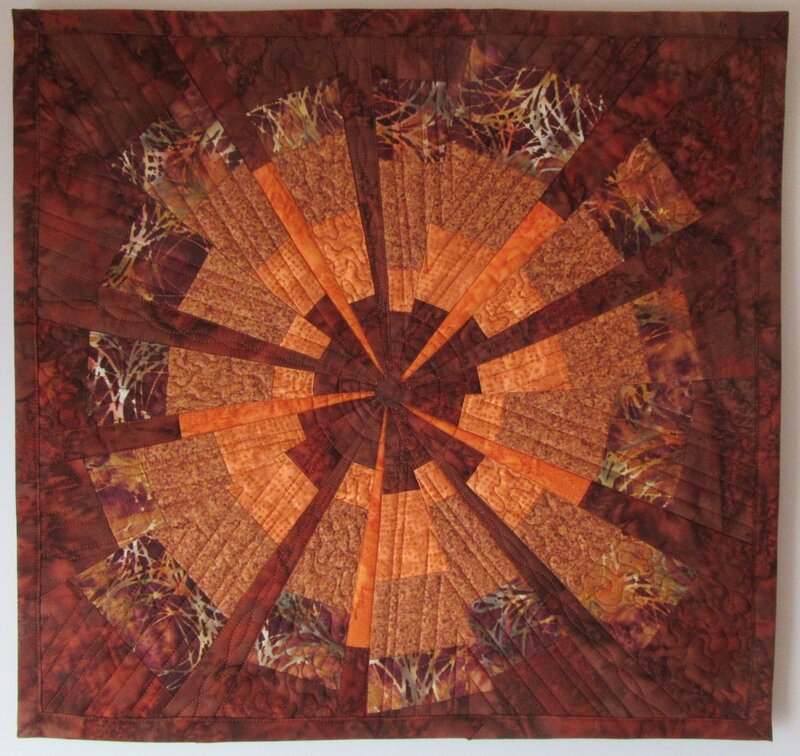 I’ve shown the original quilt at the beginning of this blog and the newer version at the end. My design wall was invaluable as I tried out new colors and this new design addition. 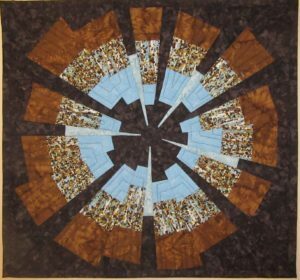 Don’t forget the step back rule….always take a look at your quilt designs from at least 10 feet back. I often take a photo with my camera also. The photo gives me a better view of how the colors combine. I was so excited with the success of the second Brown Rust Star, I decided to try a third similar design but this time I added some blue to the brown and a new print for the highlight fabric. This one also came out great!! It is lots of fun to experiment!